Juan Ponce de León, was an early European explorer of Florida whose name will forever be linked with his search for the elusive Fountain of Youth. He never found that fountain, but today his name graces the natural spring at a state park in a town that also shares his name. 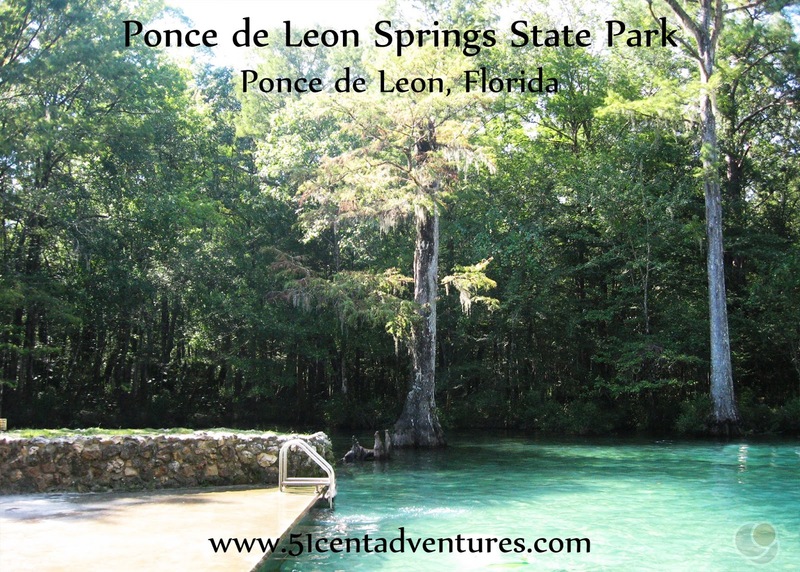 Ponce de Leon Springs State Park is a small day use park in the pan handle of Florida. 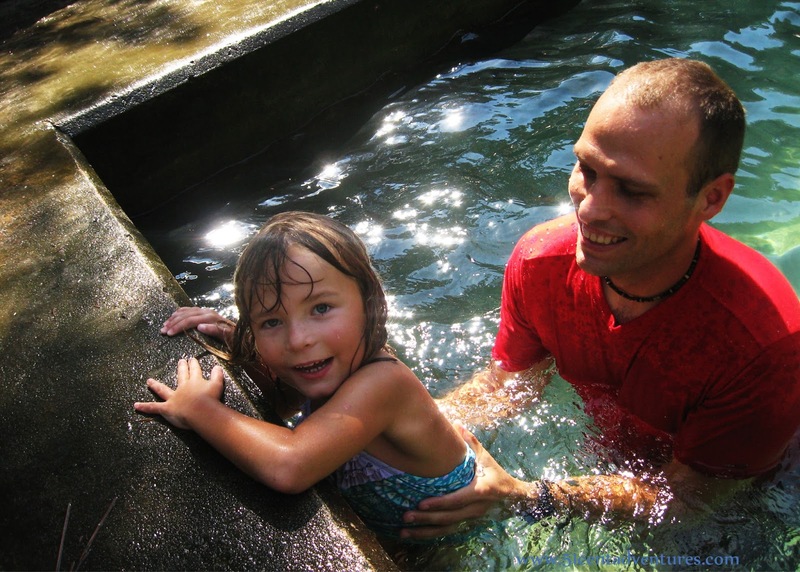 Visitors to the park enjoy swimming in the cold waters in a swimming area built around the spring. Location: 2860 State Park Road Ponce de Leon Springs, Florida. Ponce de Leon is about 100 miles west of Tallahassee. August was a weird month for my family. At the end of July we found out that my husband would be leaving the Army sooner than expected. We had as little as one month to prepare to move. Since we were expecting to do a multi-state road trip in the near future we decided not to travel anywhere during August. Consequently, every weekend was spent downsizing our stuff, saving our money, and getting our house ready to turn back over to our leasing office. When September rolled around, and we were still living in Alabama, my husband and I decided that we needed to plan a little get away for Labor Day. 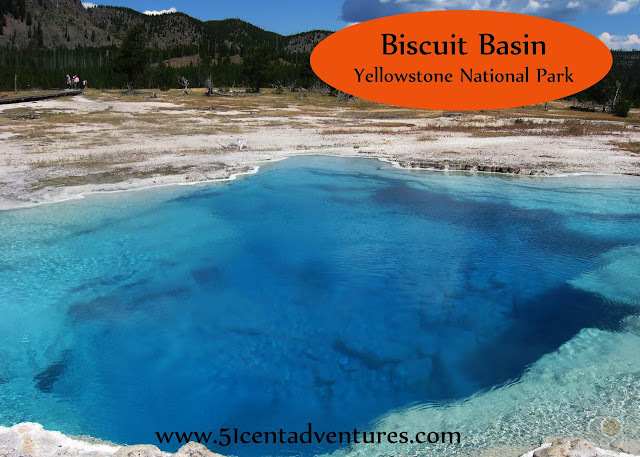 We considered going back to Providence Canyon State Park, or even doing our long talked about trip to Tallahassee. However, neither of those plans happened because one of the twins came down with strep throat. That week we got the amazing news that the Army was going to keep my husband around for a few more months after all. This was great news for many reasons (more time to save money, kids can stay at their great school, and so on), but one of the best reasons was that we had more time to explore the fun things in this area. And boy, we were despite to get away from the house and go exploring. The last trip we'd been on was when we went to St Joseph State Park six weeks earlier. There was one little problem - we were completely out of the habit of going anywhere. You know that rule that says that "a body in motion stays in motion"? Well, it also applies to an active family. Normally my family is in a routine of going on a camping trip or day trip every other weekend. When we are in that routine it's easy for us to pack up the gear, food, and kids and hit the road. But after 6 weeks of hanging around the house everything required to get us from Point A to Point B seemed like a ton of work. We knew we needed to go somewhere, but we also were in no mood for a camp out or even a long drive. My husband and I talked about places that were close and inexpensive. I realized that I already knew the perfect place - Ponce de Leon Springs State Park in Ponce de Leon, Florida. Ponce de Leon is less than 20 miles from the Florida/Alabama boarder. It's a little over an hour away from Fort Rucker, and so it was the perfect place for my family to start to get our exploring inertia back. We drove down to Florida in the afternoon of Saturday, September 10. 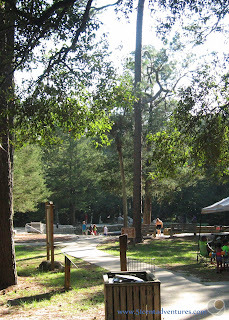 When we arrived we discovered that the park was hosting a free admission day. So we didn't even have to pay the entrance fee of $4 per car. If we'd arrived earlier we could have had free hamburgers and hot dogs too. But we'd brought out own picnic stuff so we didn't need that anyway. We had a quick picnic. 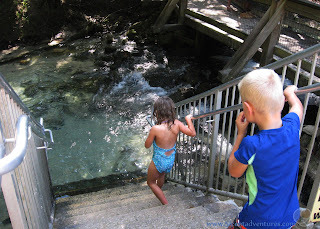 Then everyone changed into swimming suits in the restrooms, and we went down to the springs. I was expecting to just see a natural hole in the ground with water coming out of it. But instead the spring had a swimming pool built around it. The day was hot and humid so we were all excited to get into the water. But as soon as we put our feet in the water we changed out minds about that plan. The water was COLD. It stays at 68 degrees all year long, and for how hot the day was the water felt like it was freezing. Just putting my feet in took a lot of courage. My husband got in the water. Even though his teeth were chattering he somehow convinced our daughter to get in the water too. I'm not sure how she felt about this. I was content to stay on the side. 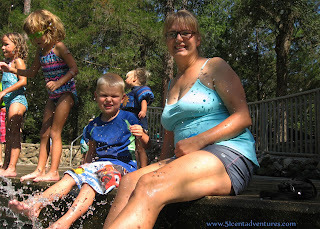 My son kept splashing me, and that was cold enough. For a while I was wondering if we'd driven all that way just to sit on the side of a pool, but then I saw that the water from the springs ran off into a shallow stream. I figured we'd probably be able to stand that water. So we went over there and went down the stair case into the run off water. 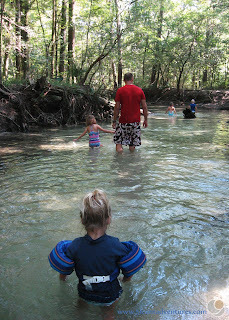 This water was slightly warmer, and a lot more shallow so the kids didn't mind getting in. For a while the kids played in the sand on the river bank, and climbed on the retaining wall. We decided to go for a walk down the stream. One of the twins had been asking all morning to go for a hike in the woods. I told her this was one of the most unique hikes we'd ever go on. We didn't go very far down stream, but it was quite an adventure. Sometimes the water was up to the children's chests. 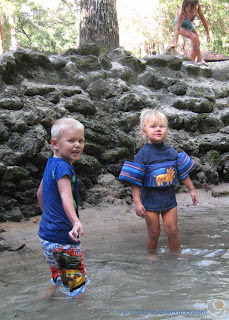 The bottom of the stream was smooth sand so it didn't hurt our feet at all to walk on it with bare feet. We'd pass submerged logs that were starting to get covered with sand. It was amazing to walk in that water, while passing trees dripping with Spanish Moss. This felt like a something from an exotic vacation - not something you'd do on a whim on a Saturday afternoon. We came back to the spillway area where the kids played for another 15 minutes. My husband took a few of them on a short hike on one of the hiking trails above the water. After a while we decided that we were ready to go home. Everyone changed in the bathrooms once again and then we drove back to Fort Rucker. It had been a great afternoon and all of us were happy to have gone on an adventure again. We were also happy that we still have time to visit all the amazing places around the area. Recommendation: Ponce de Leon Springs State Park is the perfect place to cool off on a hot summer day. 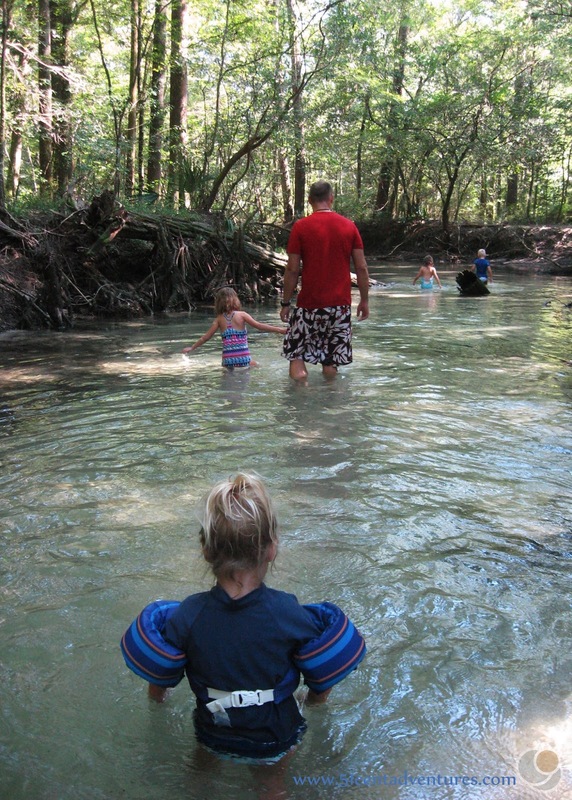 For only $4 a car your family can have hours of fun swimming in cold water or exploring the hiking trails. Directions: Ponce de Leon Springs State Park is located just a short distance from the I-10. Take Exit 96 and head north. Turn right onto Main Street followed by another right one Ponce de Leon Springs Road. The park entrance will be on your left. Places Nearby: Morrison Spring is located 7 miles south of Ponce de Leon Springs. The nice thing about Morrison Spring is that there is not an entrance fee. This spring is managed by the Walton County. 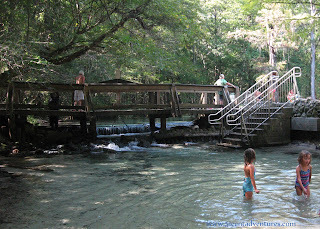 You can scuba dive in these springs in addition to swimming.